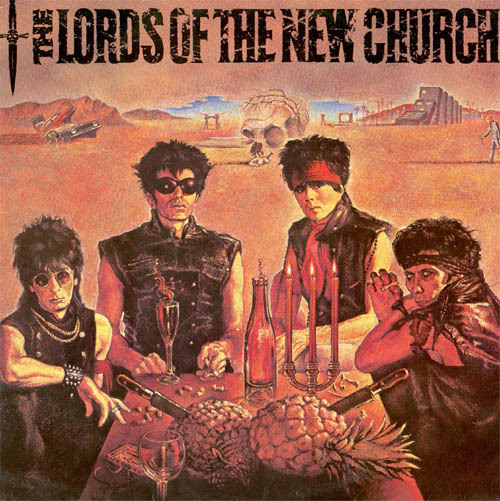 The Lords of the New Church were an English/American post-punk supergroup with a line-up consisting of four musicians from prominent 1970s punk bands. The band reformed with two of its original members in 2003. Formed in 1982, the band featured punk pioneers Stiv Bators (The Dead Boys), Brian James (The Damned), Dave Tregunna (Sham 69) and Nicky Turner (The Barracudas). The band recorded three studio albums and one live album in their career together before Bators ended the band onstage after a concert on 2 May 1989, at the London Astoria. They had one surprise Top 40 hit in Canada in 1982 with the single "Open Your Eyes." A more contrived attempt to have a global hit with a parody cover version of Madonna's "Like a Virgin" in 1985 proved less successful, but ironically remains one of the band's best known single to date. Bators died after being struck by a car in Paris in 1990. Founding members Brian James and Dave Tregunna reformed The Lords of the New Church in 2003 with vocalist Adam Becvare of The LustKillers. The lineup recorded the ten-song CD Hang On and toured Europe in spring of that year. Becvare then resurrected Vancouver's The Black Halos in 2004, writing and recording two albums, Alive Without Control and We Are Not Alone, and touring internationally. The Lords of the New Church fronted by Becvare continue to perform live and write new material when Becvare is not touring with The LustKillers.